Mr. Go. The classic tale of a girl, a gorilla, and the Korean Baseball Organization. Truly, one of the greatest Bizarre Baseball Culture entries of all time, and one you should totally consider purchasing if you are a fan of such things. But what if it was brought to American screens? How would it be adapted? The cute little Chinese girl, Weiwei, would stay, as would the backstory of her and her gorilla, Ling Ling. Similarly, the main antagonist of the film would be Liao Xiaogang, AKA “Tianjin Guy”, a corrupt nouveau-rich businessman/gangster. This is a purely economic move. China is now one of the leading movie-going countries in the world, and the only way a baseball movie is going to get any attention there is if it has a Chinese person in it. Also, so much of what drives the plot is the fact that Weiwei is an outsider just trying to keep her friends and circus at home from being folded up. The jerk-with-a-heart-of-gold scout, Sung Choong-Su, would instead be an American named Samuel “Sunny” Chance, played by James Franco. For one thing, James Franco has experience with apes, and also he is able to do both comedy and drama, which this film would require. 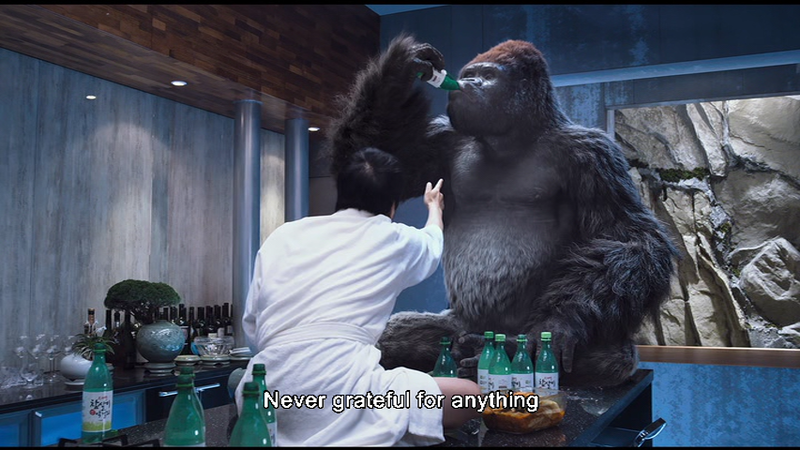 Also, I think civilization in general needs to see James Franco make drunken confessions to a baseball-playing gorilla who is also drunk. Instead of going to the Doosan Bears, Ling Ling/Mr. Go would be a member of the San Diego Padres. Don’t try to argue with me on this, you aren’t going to win. The general manager of the Padres will have an expanded role and be played by John Goodman. Jonah Hill would make a cameo as a sabermetrics expert who suggests how they can best use Mr. Go. Both because he’s always in movies with James Franco, and as a reference to Moneyball. There would be a subplot about how some people think Mr. Go isn’t playing the game the right way after he unleashes an epic bat-flip. It’d provide realism to the affair. After Mr. Go’s rampage, Weiwei and him would go on Jimmy Kimmel to prove he isn’t a monster. Instead of a bidding war between the Chunichi Dragons and Yomiuri Giants, it would be the Red Sox and Yankees. Because of course it would be. The veterinarian’s role would be expanded and made into a female love interest for Franco’s character, probably played by somebody quirky like Zooey Deschanel or wittily sarcastic like Anna Kendrick. Because every goddamn movie, it seems, needs a love interest of some sort, and it sure as heck isn’t going to be Weiwei and Franco. The NC Dinos, the main opponent of Doosan, would be replaced by the Dodgers. Also, the Division Series at the end of Mr. Go would be replaced with a final regular season series where the NL West title is on the line. This both would better explain why every game is a home game for Mr. Go (in the Korean movie, they come up with an excuse about renovations at NC’s stadium) while still providing plenty of drama. Leiting, the evil pitching gorilla who faces Mr. Go, will be renamed “Lightning” instead of “Zeros”. Because Zeros was a dumb name. The ending would be left more open to the “Football-playing Gorilla” sequel than the original movie was. Every movie needs to have a opening for a sequel. And, finally, it goes without saying that Andy Serkis would be playing Mr. Go. This entry was posted in Baseball, Blogathon, International, MLB, Movies, TV and such, Uncategorized and tagged baseball, Blogathon, gorilla, idea, James Franco, movie, Movies, Mr. Go, Proposal by danglickman. Bookmark the permalink.